After reading Tyler Rice’s “My Educator’s Oath,” I wanted to create my own. Here are my goals for myself this year! 1. I will treat each student as an individual, unique in her strengths and in her needs. I will avoid making assumptions about her and use my best skills to investigate and understand her. 2. I will seek to encourage all of my students to ask questions and to investigate, to present their ideas and to defend them. 3. I will remember that learning is hard work. I will work on pacing my classes so that there are times of intensity and times of play. 4. I will present new ideas and skills in many different ways so that students have an opportunity to learn them through diverse methods. I will surprise and engage them. 5. I will not assume that something is “easy” until I am sure that every student understands it. 6. I will make sure that there is a purpose to every assignment and every task that I give. I will avoid giving work simply to have something to be done for homework. 7. I will not teach a lesson simply because that is how I did it before. I will evaluate and critique before class, looking for the ways to make each one better. 8. I will identify what the learning is that I want the students to do and will explain it clearly to them before they begin. 9. I will grade assignments as quickly as possible, getting them back in time for the students to learn from their successes and their mistakes. 10. I will share my own love of learning, being open about the challenges and the joys involved in it. 11. I will laugh at my mistakes and never try to hide them from my students. I will apologize when necessary and model a willingness to learn from them and move on. 12. I will not allow myself to become stagnant or complacent. I will spend time each week connecting with other educators, seeking to learn and grow in my own practice. And a new year starts! Last night was an amazing experience of the power of educators working together to help students and support each other. 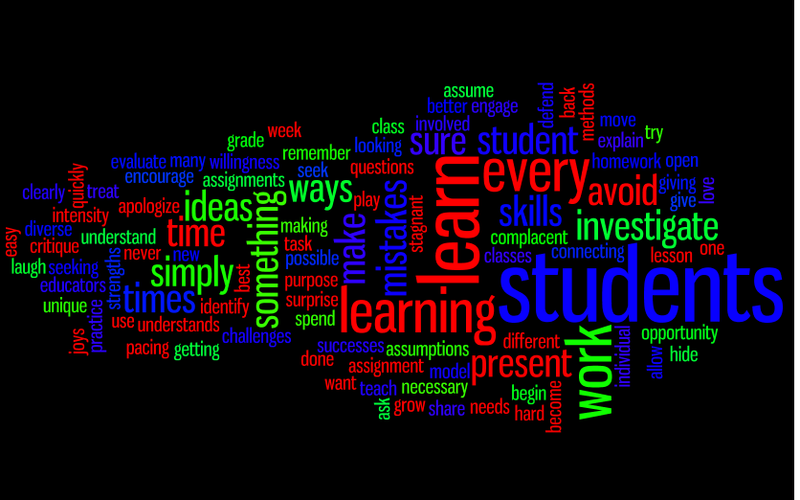 For the hour of #edchat, a conversation on Twitter at 7:00 pm every Tuesday, ideas and excitement was flying! (If you missed it, check out the archive!) Here it is, the middle of August, a time when many teachers are filled with dread and pre-exhaustion worry. It is when we face all of the tasks that we do during the school year, that are now lying like discarded balls on the floor. We know that we have to get them all up and floating effortlessly. It often seems like an impossible task. As a friend described it, “August is like a month of Sunday evenings.” We all know that School is coming towards us like a tidal wave. And yet, last night’s conversation was filled with energy and determination. Teachers were sharing their ideas about what makes an effective teacher, speaking from a wealth of experience, sharing tips and insights into how to make each day the best that it can be for the students. Rather than dreading the return of the kids, these teachers were excited to once again share and grow with the children in their classrooms. They had, in many cases, spent the summer focused on how to enhance their best practices and to improve on the weak spots in their curriculum. None of them was complacent about what they do. They were dedicated to learning and to improving their practice. There could not possibly have been a better way to spend a late August evening than with these educators. I left with a whole new excitement about the coming year. It is an excitement that combines my own teaching with the joy of having colleagues with whom I get to share the journey! A year ago, I qualified as mostly a Lurker on Twitter. I followed many educators, but I had only just begun to enter into the conversation. Now, my practice and in many ways, my life has been changed by the interactions and relationships that have grown up among the people I have “met,” some simply online and many now in person. I have worked harder than I ever thought I would, because I have partners in this adventure. They cheer me on to do my best for the kids, and I, in turn, cheer them on! We are on a journey to figure out how to make education in the 21st century the best that it can be. None of us has the answer, but none of us is sitting on the sidelines. We are experimenting and trying to find what works. Sometimes the lesson is a failure, but because we are not alone, we can share our attempts and get feedback from other teachers. It is all about Shared Growing and Shared Wisdom. Last night reminded me of how important all of you, my face-to-face colleagues and my PLN partners, are to me. So this is a Thank You to all of you who have shared with me this year, and a Welcome to all that I will share with in the coming year. The energy and support that we give each other makes us better educators and provides an exciting environment within which the students can learn. I have been pondering what it is that we need to teach students about multitasking, and the pull of wanting to stay connected and engaged with so many people, jobs and mountains of information all that the same time. As my son commented, “What used to be a shout down the hall from a colleague has become the entire world shouting at us, all with a volume of urgency.” There are always messages coming at us, and we have to figure out how to work the most effectively in the midst of them all. The barrage is not going to stop, so we have to create spaces for ourselves where we can work to our best ability. And we have to teach our students how to create those spaces for themselves. We, and our students, are multitasking all of the time. We talk and text; write blog posts and check our email or the weather; we walk the dog and respond to phone messages. We have been and are creating a world where there is access to everything all of the time. One of the fascinating parts of the report was that those who were tested to see if they worked as well while multitasking refused to believe the results. They were convinced that they had done just as well when doing many jobs as when doing simply one. This is a powerful mythology that we need to address in ourselves and in our students. We imagine that there is no difference in our work when we flip our eyes up to our Tabs to see if we have a new email or switch to quickly check the weather or the ballgame score. It takes up space in our Working Memory to be thinking about checking those Tabs, space that no one can afford to lose. “To the extent you have less working memory, you have less space for storing and integrating ideas and therefore less to do the reasoning you need to do,” says Art Kramer from the University of Illinois. So how do we teach students to focus on one task at a time, when the shift in their email from nothing to (1), will scream “Urgent” to them? The slight pounding of their curiosity will begin, taking up valuable space in their memory. While the email may simply be that they have received a coupon from Staples, there is no way for them to know that without clicking over and seeing what has arrived. The call of that (1) on the Tab is so powerful. It might be important; it might be life-changing, creating a powerful the Siren call. My first thought is to start the year with a discussion of these studies, perhaps have the students watch the Frontline show. I also want to give them 2-3 minutes at the start of class to check their email and then close it, acknowledging that their desire but modeling how to control it. For the first few weeks, I want to check all of their screens before continuing on. While I know that some of them will easily reopen whatever they close, it will set a standard for those who want to learn and connect with the class. I am thinking of showing them Google Tasks, in their email and suggesting that they begin to keep lists of what they want to do and when they want to do it, as a way to identify what is important and why. I have spent a long time thinking this summer about what I want for a class website and whether what is appropriate for one class will work for all of them. Here is my thinking so far. Every class and every website needs to meet the specific needs of the teacher and the students who are going to be using it. What works for one teacher may well not work for another; what is effective for one class may prove confusing for another. A few of the ones that I have been experimenting with are Google Sites, Edmodo, iWeb and Wikispaces. All of these, and many others, can meet a teacher’s needs. It is simply a matter of identifying what is the most important for the students and the teacher, and then matching those with the tool. These are just a few, but each goal you set will affect the kind of website that is needed. An important thing to remember, as you go through this process, is that you can always change the tool if it isn’t working out. It is a really important lesson for us to model for our students that in the 21st century, needs and strategies are changing all of the time. We need to be able to adapt to success and to challenges. If the tool you choose does not meet the needs of your students, then change it. Here are some questions to ask yourself as you play around with some of the tools out there. Try the ones I mentioned, but definitely search for yourself. Will this be an effective hub for the class? Will it be easy for students to find the important information? Think about what you want the students to get from the website. Will it provide what you want them to have in an efficient manner? Can it hold all of the necessary links, documents, calendars and more that a student needs to succeed in the class? Most sites will hold all that you want, but be sure to investigate what it looks like after it has been loaded. Is it easy for them to understand? Some do not look like what a student would expect. How is the website organized? Does the organization match the grade level that you are teaching? Does its organization work with the way you, as a teacher, think about the class? There are lots of tools, so take the time to experiment with which one works the best for your learning and teaching style. Are there pages or is it a blog-style? Can your students find what they need on the pages or within the blog? For some classes, having the pages organized by units is very helpful; for others, an ongoing blog with the ability to tag is the most effective. Is it easy to add pictures to your website? Picture are critical to making a website visually appealing. You need much more than text. Try adding photos to the site. Is it challenging to move them or manipulate them? Students love seeing their pictures on the website, so make sure that you can add them, even if it is just the backs of their heads. What tools or widgets can be added? Can you add Google Maps, or YouTube videos, etc. Depending on the purpose of the site, these can enrich the students’ experience. Can you have conversations and collaboration on your site, if you want it? If you decide during the year that you do, can it be added? Online collaboration is an important skill for students to develop. Is this a place where you could begin to teach it to them? And last but not least: Will this site appeal to my students? Will they enjoy the experience of using this? This is really important, because we have very savvy students. They are familiar with all sorts of websites, and if the tool feels too dated, they will not be drawn to use it. There are so many more questions that each teacher will have on what is the best tool to create a classroom website, but these are a starting place.